​“Ghosts in the noise” is a body of work which is created using hand-cast rubber rollers covered in raised dots. 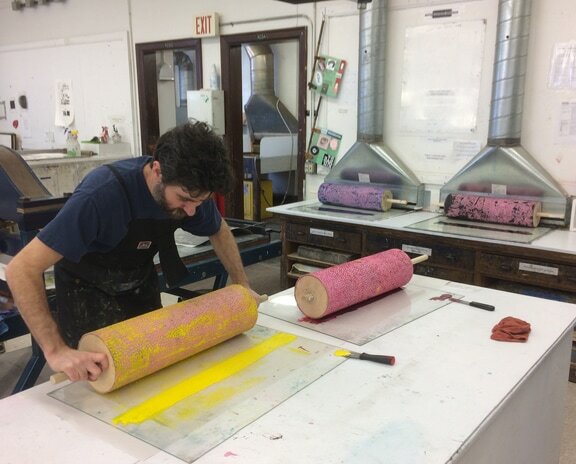 The rollers are inked up using cyan, yellow, magenta and black. The dots and colors reference the building blocks of printed ephemera. During printing, patterns and images begin to emerge out of the random color relationships and dot placements. The resulting color relationships and images ask the viewer and participating creator to examine their interest in seeking deeper meaning and context for what is, at its core, just random chance." In addition to creating a series of relief monotypes, Sukha also lead a collaborative printing workshop with printmaking students. I'd like to thank the great print assistant we had on this project: Shelby Hanson.